Lincoln St., Ponsonby, Auckland 1981. From the series: Polynesia Here and There. Cibachrome print. Purchased 1983 with Lindsay Buick Bequest funds. Te Papa. 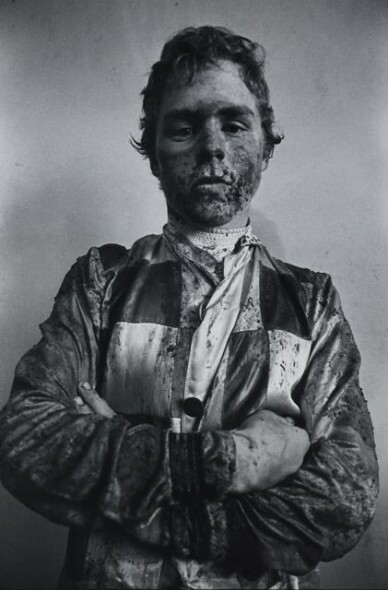 Ashburton, Jockey Club, 1978. Gelatin silver print. Purchased 1979. Te Papa. His next major documentary project was on the Black Power gang in Christchurch. He already knew some key members from childhood, so a level of trust existed from the start. However, he still practised the classic documentary technique of spending weeks hanging out with them until he was accepted enough to bring his camera along. These photographs were published in PhotoForum 46, 1980. Baldie collecting gang fees, Canterbury Plains. From the series: Black Power, Christchurch. 1979. Gelatin silver print. Purchased 1994 with New Zealand Lottery Grants Board funds. Te Papa. It was a study trip to the USA in 1980 that set him on a course that was to become his life’s work: photographing other cultures, particularly the peoples of the Pacific. At the International Centre for Photography in New York, former Life magazine editor Ruth Lester pointed out the number of Pacific Islanders who appeared in his black and white shots of Auckland’s Karangahape Rd and Queen St, suggesting that they would change the face of this city in the same way that Latinos had changed New York. In the US he was also surprised to discover that colour photography was often used by leading documentary photographers such as Mary Ellen Mark, even though their images might be known only through black and white magazine reproductions. Karangahape Rd, Auckland. From the series: Karangahape Rd and Queen St, 1980. Gelatin silver print. Gift of the artist, 1983. Te Papa. New friends and acquaintances led to invitations to visit their islands. Glenn spent six months in 1981 photographing in colour in Niue, Tonga, Samoa, Tokelau, and the Cook Islands. The work culminated in a touring exhibition Polynesia Here and There (1983) that combined his Auckland and Pacific work, and later appeared in a book, Pacific Images (1987). The experience began a career of photography and publishing that was often hand-to-mouth but which, he said, once discovered he couldn’t get enough of. The number of book titles mounted to a total of at least 70, many of them educational booklets for children. The more substantial include Pacific Island Style (1999), Feasts and Festivals (2002) and Pacific Pattern (2005). Sataua, Savai’i, Western Samoa, 1982. From the series: Polynesia here and there. Cibachrome print. Purchased 1983 with Lindsay Buick Bequest funds. Te Papa. I first met Glenn in Auckland in 1981 or ’82. We walked around Ponsonby and K Road, and he seemed very street savvy (courtesy the Black Power experience I guess), and to know just about everyone. And as he would always do, when we looked at his photographs he pointed out the underlying stories. Viewing his images of factory workers, for instance, I remember him claiming that the basis of the New Zealand economy wasn’t farming so much as the Pacific Islanders working in the factories of Auckland on low wages. And how sad it was that people who had lived by fishing in beautiful environments might now find themselves working in a smelly, wet and cold fish factory in Auckland. Jaybel Fisheries, Auckland 1981. From the series: Polynesia Here and There. Cibachrome print. Purchased 1983 with Lindsay Buick Bequest funds. Te Papa. Glenn rarely focused much on the negatives of life though. Instead, he never seemed to tire of attending Polynesian festivals, ceremonies and events in search of new images. 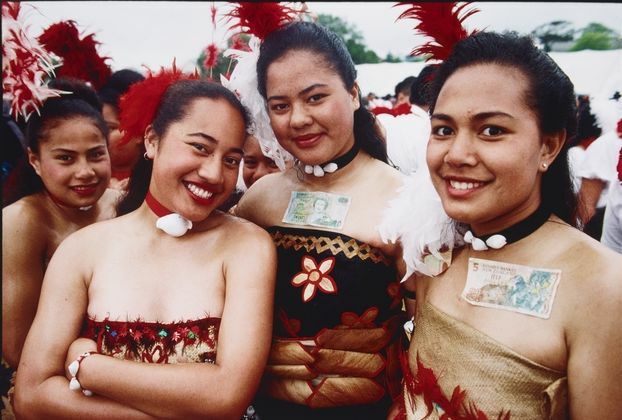 Tongan dancers raise money by performing at the launch of the Tongan Free Wesleyan Church, Vaine Mo’onia, Grey Lynn, Auckland, 1994. Inkjet print. Te Papa. I think of people as being on journeys. Some people are into spiritual journeys, some people are into money journeys. I’m into a people journey, and my photography is an expression of that. Auckland Art Gallery has a substantial collection of the Race Day photographs. And you can see many Pacific images on Glenn’s own website. This is fronted with one of his favourite images, a man with a fish in his pocket (which he explained to me as simply the logical place for it if you aren’t carrying a bag or bucket). Glenn always delighted in incongruity. Farewell Glenn. You were taken too soon. I was lucky enough to be mentored by Glenn In 2008, while living in Grey Lynn…. And, as so often happens he was the one who said that one line that changed my life forever……. What a talent he was — those photographs are just stunning. I’m so drawn into the story that each one tells. I enjoyed Glenn’s guidance for a few photography classes at ATI in the 1980s. Thank you Athol – this is a wonderful read about his life. Never just a financial transaction with you. Loved that you were right there choosing a frame with me. Always an emotional transaction. Remember when I spotted the surf and cloud on your mantelpiece one evening and Bob’s your Uncle it was ready in a week. Huge it was and you were so excited. I was blown away when I saw you last Saturday and you had a replica of the surf right behind you but with a better frame. Naturally! It was my privilege to have traveled and worked with Glenn Jowitt as field researcher for the original Pacific Images collection in 1981/2. We traveled for six months documenting festivals, ceremonies and daily life in Western Samoa, Tokelau, Tonga, Cook Island and Niue. Our work was exhibited at the Auckland City Art Gallery in 1981/2 and also published by Paradise Productions in 1987. From the outset Glenn’s mission was to “promote a greater understanding of Polynesian life in Auckland and in the homelands”. Having visited the stunning Pacific Images exhibition again today, some 33 years later, at Wallace Arts Trust (Pah Homestead) there is no doubt that Glenn Jowitt exceeded this goal. Love you Glenn – keep snapping mate! Glenn taught me photography at AUT during ’90-92 and I’ll take his love of life and framing skills with me forever. He taught me to get close and tell a story. His home was always open and his gift for interaction was genuine and forthright – I owe him more than than the photography skills he taught me. His body of work is immense and incredibly important and I hope we see a retrospective soon. Thank you Athol, that was a wonderful tribute to Glenn. I shared a flat with Glenn and his girlfriend when they came up to Auckland in the late seventies, we remained friends, and although I have lived overseas for twenty years, I would often pop in and see him when I was back, we would drink cups of tea and chat, I always loved to look at his wonderful collection of pacific Island hats displayed in his living room, every one had a story,he spoke with such pride about each hat, they were beautiful works of art, he gave me the ‘hats on the bed’ photo for a wedding present, so it was wonderful to hear him talk about how that photo came about. We will be having our own farewell to Glenn in Bangkok this week, with some of his old friends who just happen to be here this week. Farewell Glenn you brought colour , joy and friendship into many lives, you will be sorely missed . Apologies it should have read. Pacific Islands. So sorry to hear about this loss. What a shock. Through the eye of his camera, Glenn celebrates – and is witness to – the often hidden life in the rich tapestry of life in Auckland and the Pacific. He was my favourite tutor at AUT where he taught photography as part of the design degree. Years later I worked with him, putting together the design of his card collection which I will treasure all the more. I still hear his voice pushing me further out of my comfort zone when I take photographs now (and lovely to have a sound bite on Te Papa’s tribute). It was a thrill to cross paths on occasion around Grey Lynn where we live – always genuine and kind, a giving person with exciting projects on the go. He was the kind of guy to put others at ease – a perfect quality for a gifted photographer. Thank you Athol for the beautiful summary of Glenn’s career. I am very grateful to be able to hear his voice telling some of his stories on your website. I have grown up with these tales about the lengths he went to get this image, or what was happening just out of frame in that image, or what happened immediately after the shutter went off. His photos are so alive with both his stories and the stories of the peoples he documented. Not being able to hear these anymore from him with all the gestures, laughs, dramatic pauses and stern looks that he would add makes me ache. Claudia Jowitt (Glenn’s niece). Such a loss to the photographic community, Glenn’s and his work will be forever etched into the history of photography in New Zealand and the Pacific Islands. My condolences to his family…You have done your duty here very well and left this way so very young but your memories and work will live on around the world because we are one global village and photography never dies as long as the world keeps on spinning. Rest in peace! I met Glenn in the late ’70s, when he visited me at Waikato Museum to talk about the show there of Race Day, and to show me some of the Bllack Power. Series, which blew me away. His later wotk with Polynesian communities has served as a model many years after that for me when I started work on my documentary project on Nothern Laos etnhic minority groups. Thank you Glenn, you left us far too young.